This is my favorite time of year, happy Fall everyone. I only wish I could still smell the burning leaves as we did when I was young. Now you’d need a permit and it’s rarely done, but back in the old days, that was a sure sign of Autumn! My big news is that I’m offering sculpting classes in Paperclay. This is a medium I feel very comfortable teaching as I’ve made many a Christmas ornament for my 9 years of “theme” trees at Concord Museum’s Family Trees Exhibit. 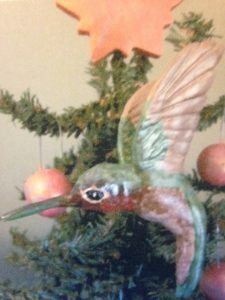 I thought I would start with a Hummingbird Christmas ornament, and I am running 2 workshops in November at my home studio. November 4th and the 11th, both Saturdays. It is for beginners. Students will leave with a completed ornament, the workshop is 4 hours with a break for tea/coffee and scones. Each workshop will run from 1pm to 5pm and the cost is $65.00. The workshops are for students 18 or older as it’s too long day for a younger person. I am open to teaching anyone privately, please contact me at mandrioli@aol.com for details. On the racks there is a new Anniversary, Thank You, Birthday, Halloween and Thoreau Card. On the drawing board is a Birthday, Thanksgiving, Christmas, Wedding, New Baby, and Catattitude. Full speed ahead!! My Redro cat toys have been selling very well at Verrill Farm in West Concord. They are now also available at Chip-in-Farm in Bedford, MA. A new design is also coming. I have two fall fairs that I am attending, the Harvest Craft Fair in Sudbury at the First Parish Church, on October 14th, 10a-4p and the Conant 36th Annual Artist and Craft Fair, October 22nd, Conant School , Acton, MA 10am-4pm..get ready cause here comes Christmas!!! As usual I will be joining my buddies, John, Bob, Kathleen, Pat and Cooper at theBarrett/Byam Farm Fair in Chelmsford, September 16th 11a-4p. It free and a very fun old-time New England Fair. Several of us will be at the Java Room in Chelmsford, including Jon Swenson, on Dec 9th, 8p-10p another free and fun venue to get in the Christmas spirit. Well I guess that is it, but I can’t sign off without mentioning how grateful I am for all your support. This year my card sales are up 50%, and I owe it all to you, thank you very much!! Copyright ©2015 Elizabeth Mandrioli. All Rights Reserved.